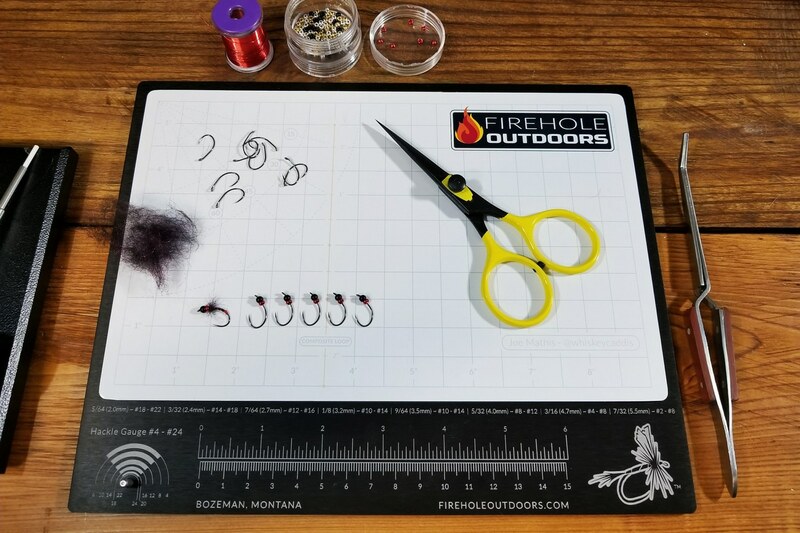 The Magnetic Fly Bench is a new evolution in fly tying reference and bench top assistance. Laser cut, anodized, heavy aluminum base. 60 mil high strength magnet. Hackle gauge for sizes #4 to #24. Please Note – The Magentic Fly Bench will ship separately from other items in your cart. Shipping charges will be shown as separate line items the Magnetic Fly Bench(es) and for other items. Send mine with a metric grid! You have up to 35 characters, including spaces, to express yourself. Firehole Outdoors reserves the right to refuse any customization that, by its own discretion, is deemed inappropriate. These Magnetic Fly Benches are perfect for staging hooks! I use it daily without fear of something rolling off. Everything I need from measurement to hackle gauge is right at my fingertips. It’s a must have tying aid.